Part 1. Introduction to problem-solving in artificial intelligence. 1. Historical and bibliographical remarks. 2. Problem-solving and artificial intelligence. 3. Knowledge and state-space representation. Unordered search methods. 4. Problem reduction. Ordered search methods. 5. Expert systems. Part 2. Problem-solving in structure elucidation. 6. Heuristic interpretation of one spectrum. 7. Heuristic interpretation of set of spectra. Part 3. Problem-solving in synthesis design. 8. Basic concepts in computer-assisted design of synthesis. Principal components of CASD systems. 9. Structure perception. 10. Selection of strategy in CASD. Evaluation of reactions and synthetic pathway. Appendix A. Glossary of terms. Appendix B. Compilation of references on computer systems for structure elucidation and prediction of organic reactions. This comprehensive overview of the application of artificial intelligence methods (AI) in chemistry contains an in-depth summary of the most interesting achievements of modern AI, namely, problem-solving in molecular structure elucidation and in syntheses design. The book provides a brief history of AI as a branch of computer science. It also gives an overview of the basic methods employed for searching the solution space (thoroughly exemplified by chemical problems), together with a profound and expert discussion on many questions that may be raised by modern chemists wishing to apply computer-assisted methods in their own research. Moreover, it includes a survey of the most important literature references, covering all essential research in automated interpretation of molecular spectra to elucidate a structure and in syntheses design. A glossary of basic terms from computer technology for chemists is appended. 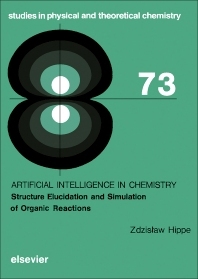 This book is intended to make the emerging field of artificial intelligence understandable and accessible for chemists, who are not trained in computer methods for solving chemical problems. The author discusses step-by-step basic algorithms for structure elucidation and many aspects of the automated design of organic syntheses in order to integrate this fascinating technology into current chemical knowledge.